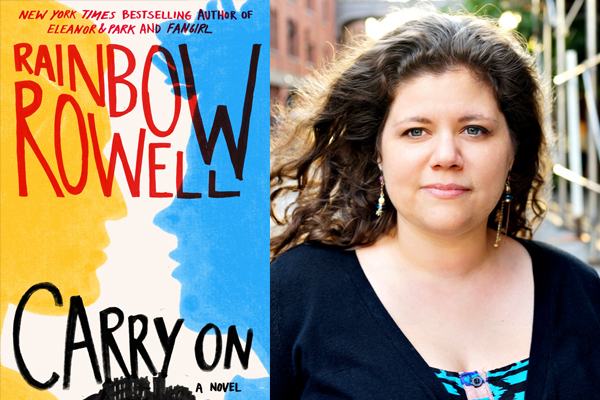 Rainbow Rowell is an author who has such a long backlist of critically acclaimed books that I’ve been trying to find time to read. Her 2013 young adult novel Eleanor and Park was one of my favourite novels of that year, and Carry On tackles some really necessary and age appropriate themes for a young adult novel. Carry On is about Simon Snow, aka the worst chosen one to have ever been chosen. He is returning to Watford, a magical school in England for his eighth and final year. And over the first few months of his final schooling year, he is forced to come to terms with himself as the Chosen One, destined to defeat the Insidious Humdrum – a creature creating magical Dead Spots all over England. Additionally, Simon is forced to befriend his nemesis and roommate Baz (who he’s fairly certain is a vampire and is trying to kill him) and has agreed to help Baz determine the cause of his mother’s death, who was the previous headmistress at Watford before the current Mage was instated. The novel is very refreshing – it’s a witty and wildy fun story. It’s told through several narrative voices, including Simon, his roommate Baz, his friend Penelope, and his girlfriend Agatha. Simon and Penelope’s friendship reminded me a lot of Hermione and Harry’s friendship in Harry Potter. I was sceptical at first because it sounded like an eerily similar plot to Harry Potter, but Rainbow was able to take a premise and a cast of characters and present them in a unique way. She did a marvellous job of crafting her own magical world using shared elements from Harry Potter and other novels set in magic schools. Carry On begins after Simon has already spent seven years at this school. So the reader really is thrown into the story and for the first fifty pages, they feel like they don’t understand what’s happening. But that’s the appeal of the novel. You miss that first few years of schooling year where Simon meets all of the other students and bonds with his friends, and you simply find out about previous events from passing comments by the characters. It means the reader is really engaged in the story, but it also provides a lot of comic relief. Simon is a fantastic protagonist. His girlfriend has just broken up with him, and he doesn’t really have any special magical ability – half of the time, he can’t even make his wand work. He seems a little lost, and unsure, and he’s constantly worried about Baz’s next prank or trick that could get Simon killed. It’s a comedy of errors for Simon, and it’s a series of hilarious plot points for the reader. The relationship between each of the characters is wonderful. The dialogue is realistic and hilarious, and quite early on in the book Rainbow drops in a major twist that I didn’t anticipate. This is a spoiler-free review so I won’t say it, but Rainbow Rowell really has a way of writing books that you want to read in one sitting because they effortlessly draw you in. She’s a master at crafting three dimensional characters with raw, moving stories and motives that make the reader relate to them. Rainbow tackles many themes in the novel that are highly necessary for its teenage readership. Two characters in the book are coming to terms with their homosexuality, and Simon of course is trying to understand his role in this magical world (considering he doesn’t really seem to have that much magical ability). This novel pays homage to the Harry Potter series through its structure and plot progression. Both books are set in the United Kingdom and Watford seems to resemble Hogwarts in many ways. Rainbow Rowell weaves magical fairytale and romance into one story, and before you know it, you’ve read the 600+ page book a lot quicker than you originally thought possible. Carry On is a love story, but also an entertaining young adult novel with lots of mystery. It’s charming, delightful, poignant, laugh-out-loud and just a wonderful read. Rainbow has created warm, fun, complex characters; if you loved Harry Potter and you’re looking for something that feels similar, Carry On comes highly recommended.